Indulge your sweetheart with this edible chocolate heart box filled with handmade rich chocolate truffles, solid chocolate hearts, creamy caramel squares, savory dipped cashews and more. Once the assorted chocolates are devoured, you can eat the chocolate box too. The box weighs about one pound empty and is filled with 14-16 pieces of chocolate. 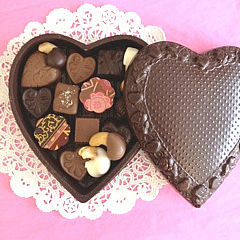 Chocolate heart boxes may be ordered in milk or dark chocolate. The assorted chocolates can be ordered in milk chocolate, dark chocolate or assorted milk and dark chocolate. You can also call to customize your heart box. Indulge your sweetheart with this edible chocolate heart box filled with handmade rich chocolate truffles, solid chocolate hearts, creamy caramel squares, savory dipped cashews and more. Once the assorted chocolates are devoured, you can eat the chocolate box too. The box weighs approximately one half pound empty and is filled with 8-10 pieces of chocolate. 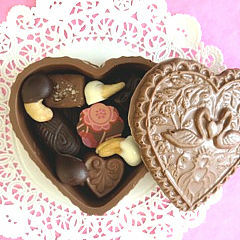 The heart box may be ordered in milk or dark chocolate. 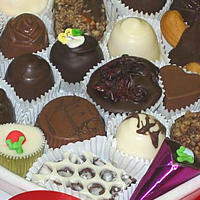 The assorted chocolates can be ordered in milk chocolate, dark chocolate or assorted milk and dark chocolate. You can also call to customize your heart box. Impress your Valentine with Sweetheart Three designer truffles. 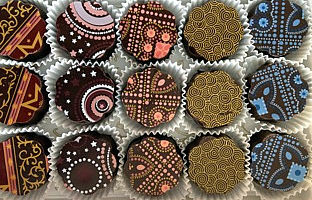 These truffles boast gorgeous, colorful graphic-designed outer shells and creamy, rich chocolaty insides. They are almost too pretty to eat. The box is beautifully wrapped with designer gift-wrapping paper and adorned with an elegant bow. This fabulous assortment includes: solid chocolate hearts, craisin clusters, coconut crèmes, buttercrunch, savory dipped cashews, peanut butter cups, turtles, pb&j, caramel squares, truffles, fruit crèmes, cookies and cream bark, and more. The box is beautifully wrapped with designer gift-wrapping paper and adorned with an elegant bow. Express your feelings this Valentine's Day with an edible puzzle that spells "I love you" in chocolaty sweetness when the pieces are joined together. The puzzle measures approximately six inches tall and five inches wide. Chocolate pieces are packaged in a clear cellophane bag and tied with an elegant bow and can be assembled easily upon receipt; that is, if you don't eat them first. 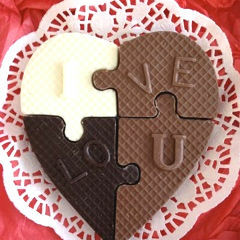 The chocolate heart puzzle is available in milk, dark, white chocolate or a combination of milk, dark and white chocolate. 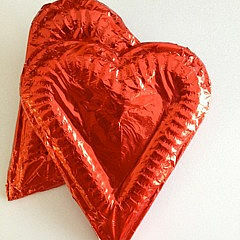 State your love simply with a pure, solid chocolate heart wrapped in red foil. Or combine one of these hearts with another Sweethearts Three Valentine's Day treat. This solid chocolate heart measures 5.5 x 4.5 inches and is available in milk, dark or white chocolate. No vase or water required for these elegant roses! Put a spin on tradition this year and surprise your Valentine with chocolate, long-stem roses. Whether a single blossom or a full bouquet, these solid chocolate roses may last as long as the real variety and they sure will taste better. 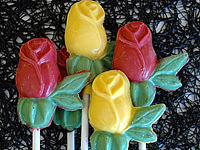 Chocolate roses are available in color-dyed white chocolate, milk chocolate or dark chocolate. You can also order an assortment of colors. 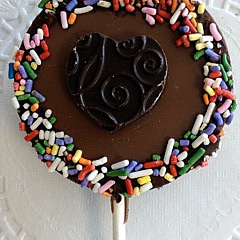 A three-dimensional chocolate pop with a heart center will surely satisfy your Valentine. This handmade bite-size chocolate heart sits atop a round, solid chocolate disk that is decorated with colorful sprinkles. Pops are available in various combinations: all dark chocolate, all milk chocolate, dark and milk chocolate and dark and white chocolate. 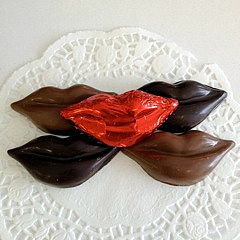 Send a chocolate kiss to your Valentine this year with edible chocolate lips. Or, send a box full of kisses with an assortment of dark, milk and white solid chocolate lips wrapped in bright red foil. Lips measure 3 x 1 1/2 inches and are almost 1/2 thick.